GET THE BODY YOU’VE ALWAYS WANTED! Spartan Health Whey Protein Powder tastes great and will ensure you hit your goals fast! Our whey protein is absorbed quickly by the body, and lets you achieve the maximum effect in as short a time as possible! It delivers fast acting protein into your hungry muscles and provides even quicker recovery from intense training. Ensures muscle recovery and development! • Ensures extreme lean muscle growth! • Absorb quickly into the hungry muscle cells and replenishes • Promotes rapid muscle recovery from intense training! • Tastes Great and mixes easily! Get great results fast, taking our clinically proven 100% natural, Spartan Health Protein Powder! • Contains high quality ingredients! • Continues working for hours and hours! • Clinically Proven formula – get results fast!! • 100% Safe Natural Herbal ingredients! Protein is the structural core of the human body and is at work in every single cell. Protein performs many essential functions in the body. It is required for growth and repair of muscle tissues. 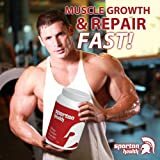 Spartan Health Protein provides an excellent source of protein which the body can use to build and maintain muscle tissue during and after intense physical activity. This is a must for any athlete, body-builder or individual. It is perfect for those who wish build and maintain a strong, healthy physique. Our protein powder is so powerful; it is the ‘amber nectar’ of the Spartans who descended for the immortal Greek gods from Zeus himself!